Do you want to feel more positive about yourself? Do you want to have more job satisfaction, better communication with people around you and achieve more? Do you want to be more creative and take more initiative? Do you want to meet with like-minded women? Do you want to manage work life balance better? Are you ready for a life changing experience? Then Springboard® is ideal for you! Springboard® is a 4 week experiential Programme, which will give you tools to make important changes in your life. You will become part of a group of like-minded women with whom you will share life-changing experiences. I offer the programme in English, French and Arabic. Who is Springboard® Programme for? Women who want to make a difference in their life and the life of others. Workshop 1: Getting started – Your goals. What do you want to create? 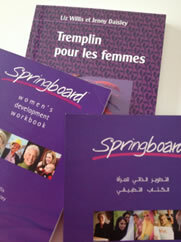 Over 250,000 women in 35 countries have already attended Springboard®. Here is a sample of the companies who have delivered the Programme.